The need for autonomy is a universal basic need of people. When it is satisfied we feel better and we function better in all kinds of ways (view this). Therefore it is wise to support other people's need for autonomy in all kinds of contexts. This can be done in several ways: by providing choice, by encouraging self-initiative and experimentation, by asking for and using their input in decisions, etc. A new study points at yet another way of supporting autonomy by respecting individuals as equals. What is the connection between respect and autonomy? Renger et al. 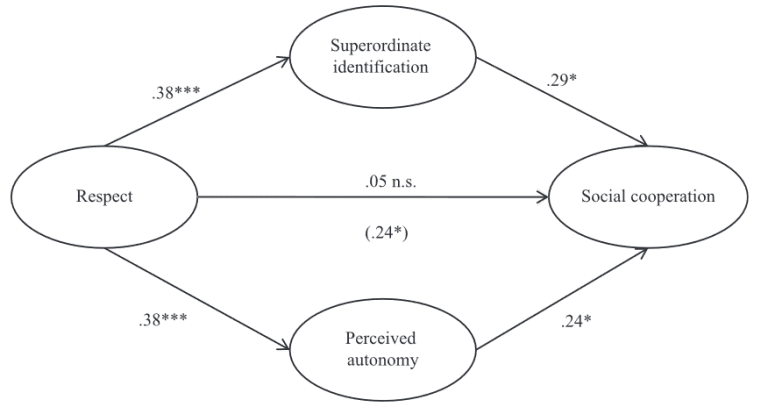 (2016)investigated in three studies the relationship between the perception of equality and autonomy. In study 1 and 2 they examined the correlations between the feeling of being respected as an equal and the perception of autonomy. Study 1 focused on daily life situations and study 2 on work situations. In these two studies equality-based respect predicted both autonomy and satisfaction (about respectively life and work). Autonomy was a mediator in the relation between respect and satisfaction at work. Study 3 was an experimental study which showed that equality-based respect increased willingness to cooperated. This relationship was mediated by two variables: perceived autonomy and superordinate identification, the feeling of beloning to the group. These relations are shown in the picture top right. This study suggests that treating people as equals makes them 1) feel more autonomous, 2) feel like they belong to the group, 3) be more willing to cooperate, and 4) more satisfied. If all of this is true - and it seems it is- this knowledge can be applied in various contexts, such as families, schools, organizations, and society as a whole. Taking people seriously by treating them as equals may be one of the most important keys to improving our social environments.